BACKGROUND AND PURPOSE: A number of flow-diverting devices have become available for endovascular occlusion of cerebral aneurysms. This article reports immediate and midterm results in treating unruptured aneurysms with the PED. MATERIALS AND METHODS: A prospective registry was established at 3 Australian neurointerventional units. Aneurysms were treated on the basis of unfavorable anatomy or recurrence following previous treatment. Aneurysms were treated with PED or PED and coils. Data including antiplatelet therapy, technical issues, complications, and imaging findings were recorded during at least a 6-month period. RESULTS: A total of 57 aneurysms in 54 patients were treated by 5 neurointerventional radiologists. Forty-one aneurysms were asymptomatic, and 16 patients had mass-induced neurological deficit. Clinical follow-up was available in 57 aneurysms with imaging follow-up at 6 months in 56. Permanent morbidity and mortality in the series was 0% at 6 months. Four TIAs and 1 small retinal branch occlusion occurred, but no stroke. The demonstrated aneurysm occlusion rate at 1 month was 61.9%, and the overall occlusion rate at 6 months was 85.7%. In cases previously untreated, the 6-month occlusion was 92.5%. Three of 6 aneurysms with a previous stent in situ were occluded. Two patients (3.5%) had asymptomatic in-construct stenosis of >50%. Acute aneurysm-provoked mass effect resolved or improved significantly in all cases. CONCLUSIONS: Use of the PED is safe and efficacious in difficult aneurysms with a high occlusion rate at 6 months, but lower occlusion rates were seen in a small population with previous stents in situ. The endovascular treatment of wide-neck aneurysms has been facilitated by the use of balloon remodelling and stent assistance, decreasing the recanalization rates that were seen with coiling alone.1–4 More recently, a number of flow-diverting devices have become available and are under evaluation.5–10 The PED (ev3, Irvine, California) is a self-expanding, microcatheter-delivered, 75% cobalt-nickel alloy, and 25% platinum mesh tube with 30%–35% metal surface coverage when fully deployed. Midterm results have been published recently in single-center registries11,12 and a multicenter international registry.13 All demonstrated that treatment of wide-neck aneurysms with PED reconstruction of the parent vessel was achieved safely. The purpose of this multicenter prospective registry was to analyze clinical experience as this flow diverter is released to the neurointerventional community and to assess whether the initial results can be generalized. The study was a prospective case registry of all patients with lesions suitable for PED at 3 Australian neurointerventional centers between August 2009 and August 2010. Aneurysms with a wide neck (>4 mm), unfavorable dome/neck ratio (<1.6), a large (>10 mm), fusiform anatomy, and those that had failed previous therapy were selected. Each case was reviewed by a multidisciplinary team; before general release of the PED, individual application for use of the PED on compassionate grounds was sought from both hospital administration and the Therapeutic Goods and Services Administration. Written informed consent was obtained. Data were collected prospectively with respect to aneurysm morphology, symptoms, previous treatment, antiplatelet and anticoagulation regimens, and technical and clinical complications. Follow-up for at least 6 months evaluated occlusion, mass effect, delayed complications, ongoing antiplatelet therapy, and in-stent stenosis. Antiplatelet protocols varied between operators. At 2 institutions, patients were pretreated with 75–150 mg daily of clopidogrel for 5 days. The latter dose has been shown to offer more reliable platelet inhibition.14 For at least 5 days before therapy, 100 mg (enteric coated) to 150 mg of daily aspirin was also given. If the mass effect symptoms were considered more urgent, patients were emergently loaded with clopidogrel (300–600 mg immediately) and 300 mg of aspirin before treatment. The higher 600-mg dose of clopidogrel is associated with more reliable levels of platelet inhibition.15 The other center chose to load patients with 300 mg of clopidogrel and 300 mg of aspirin for 2 days, based on previous coronary stent placement data.16 One center had access to a point-of-care platelet inhibition unit and could prescribe additional clopidogrel in patients with measured inadequate platelet inhibition. Dual antiplatelet medication for 6 months was maintained in the anterior circulation in accordance with the largest published PED experience.17 Dual agents were maintained in the posterior circulation for 12 months because this is a novel treatment with little published data on the incidence of perforator occlusion currently available. Patients were monitored for clopidogrel compliance by direct questioning. Aspirin therapy was prescribed life-long. All patients had intravenous heparin intraprocedurally with an activated clotting time of >200. Fifty-six of 57 patients had heparin infusion for at least 24 hours postprocedure (activated partial thromboplastin time, ×2 normal). Therapy was undertaken with the patient under general anesthesia. All PEDs were deployed by using high-magnification subtraction fluoroscopy through a Marksman (ev3, Irvine, California) 2.8F microcatheter. Initial experience with deployment involved a combination of unsheathing the device and pushing it out of the microcatheter. Additional PEDs were deployed at the discretion of the operator. Indications for multiple PEDs included inadequate neck coverage, fusiform aneurysm configuration, and an ongoing jet into the aneurysm. Ideally, stasis and a contrast/blood layer were observed at the cessation of the procedure. In some cases, coils were placed as part of the procedure before PED deployment or after jailing a microcatheter. Elective patients were admitted on the day of the procedure and discharged at 36–72 hours, with CTA or MRA, if possible, 1 month posttreatment. A 6-month control angiogram was obtained and reviewed by 2 interventional neuroradiologists. Further angiography was performed if the aneurysm was open or in-construct narrowing was present. In patients with mass effect, MR imaging or CT was also performed to assess interval change after treatment and, if possible, after clopidogrel cessation. Clinical follow-up was performed at 1 and 6 months, in addition to independent evaluation by a neurologist or neurosurgeon. Patients were also seen more regularly if they had complex problems. The primary end point was the angiographic appearance at 6 months with assessment of aneurysm closure and parent vessel stenosis. All clinical incidents (TIA, stroke, SAH, or mass effect) in the first 6 months posttreatment were documented. Secondary study end points included assessment of the influence of PED on symptomatic mass effect and aneurysm occlusion at 4 weeks by using MRA or CTA in as many patients as possible. A longitudinal study was undertaken beyond 6 months in patients with nonocclusion of the aneurysm (stopping clopidogrel at 6 months in the anterior circulation cases) or in-stent stenosis (maintaining clopidogrel). Data on 68 aneurysms in 65 patients were collected between August 2009 and August 2010. Eleven patients presenting with acute SAH were excluded and will be reported separately. This exclusion left 57 aneurysms in 54 patients for analysis. Forty-four women and 10 men (4.4:1) with a mean age of 55.7 years (median, 58 years; range, 30–83) and mean aneurysm size of 13.1 mm (median, 11 mm; range, 4–34 mm) were included. Seven were giant (>25 mm); 32, large (10–25 mm); and 18, small (<10 mm). All 57 aneurysms had a neck width of >4 mm or an unfavorable dome/neck ratio of <1.6. Forty-six were berry and 11 were fusiform. Forty-six aneurysms were in the anterior circulation, and 11 were in the posterior circulation. Aneurysm characteristics are described in Tables 1 and 2. Forty-one aneurysms were asymptomatic, and 16 patients had symptomatic mass effect with neurologic deficits. Sixteen patients had had prior treatment: 15 endovascular and 1 clipping. Four previously treated patients presented with symptomatic mass effect. 3) A case converted to PED after initial partial coiling showed a neck wider than anticipated. 1) An acute carotid cavernous fistula due to guidewire perforation successfully acutely with PED and coil deployment without sequelae. 3) An operator-based decision in a cavernous aneurysm, previously treated with coils. A poorly opened PED requiring angioplasty occurred in 1 case in which the PED did not fully open within an Enterprise stent (Cordis, Miami Lakes, Florida) (Figure 1). Persistent filling of the aneurysm required balloon angioplasty at 11 months with progressive aneurysm thrombosis evident at 18 months. A 30-year-old woman with a fusiform basilar trunk sidewall 12-mm aneurysm previously treated with an Enterprise stent some months before release of PED. A, Anteroposterior (AP) vertebrobasilar DSA demonstrates the stent (black arrowheads) within the patent aneurysm. B, High-resolution flat-panel CT scan after deployment of a single PED within the Enterprise stent demonstrates that the PED is not fully open and appears constrained within the stent (white arrow). C, AP DSA 6-months after PED insertion demonstrates some slowing of sac emptying but no change in aneurysm size. AP DSA at 11 months (not shown) was unchanged, and an angioplasty of the PED was performed by using a HyperGlide balloon (ev3), with mild improvement in appearance. The patient remained on clopidogrel. D, AP DSA, at 18 months' post-PED and 7 months' postangioplasty, demonstrates marked reduction in the size of the sac. The patient remains on clopidogrel. An acute caroticocavernous fistula occurred in 1 patient during passage of a wire across a giant partly thrombosed cavernous aneurysm. The fistula was treated with coils and PED with no clinical consequence. PED migration requiring additional treatment occurred in 2 cases. 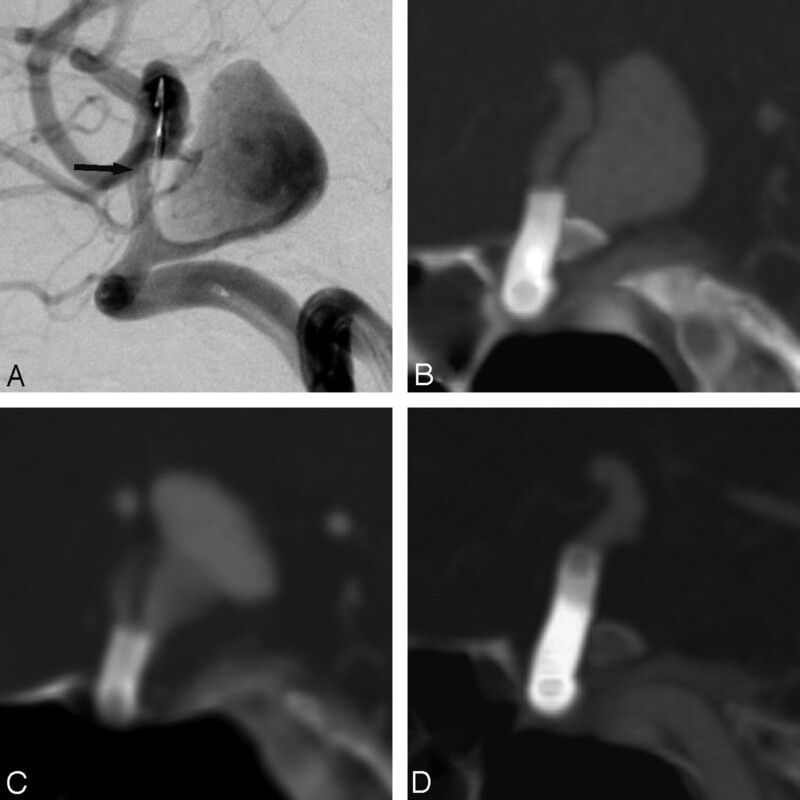 A 47-year-old man (Fig 2) had a 1-month post-PED implantation CTA demonstrating delayed proximal migration of the device, uncovering the aneurysm neck. Two additional PEDs were deployed the same day. Another patient had shortening of the distal PED, requiring placement of an Enterprise stent to anchor the PED. A 55-year-old man with recent-onset homonymous hemianopia. A 16-mm superior hypophyseal aneurysm points upwards, compressing the chiasm. A, Lateral internal carotid artery DSA demonstrates the deployed PED well covering the aneurysm neck (black arrow). B, Sagittal CTA 48 hours after PED deployment demonstrates the distal margin of PED just covering the neck. C, Sagittal CTA at 1 month demonstrates proximal migration of the PED with a jet into the aneurysm. D, Sagittal CTA 1 month after the second PED demonstrates a good position of the PED and occlusion of the aneurysm, which was confirmed at 6-month DSA (not shown). Clopidogrel was stopped. The homonymous hemianopia resolved at 5 months, and 12-month MR imaging (not shown) demonstrated marked reduction in the size of the thrombosed aneurysm sac. Retroperitoneal hemorrhage occurred in 1 patient, requiring cessation of heparin infusion at 8 hours and 2 hours of packed cells. This settled with no other intervention. There were no cases in which thrombus was detected during the case and no cases of stent thrombosis. No deaths, strokes, or delayed-aneurysm rupture occurred. One acute TIA at day 2 and 3 delayed TIAs (2 at 3 months and 1 at 5 months) were recorded. All settled with clopidogrel reloading. One case with a multilobular carotico-ophthalmic aneurysm had a retinal branch occlusion, with no clinical sequelae, after jailed coiling of the locule from which the ophthalmic artery arose. Fifty-six of 57 aneurysms were available for imaging follow-up at 6 months. One other patient, living in a remote location, had ongoing clinical follow-up, with a 1- and 14-month CTA demonstrating 50% and 100% occlusion, respectively, with no stenosis. CTA, MRA, and, in 1 patient, DSA were performed at 1 month posttreatment in 31 patients (Table 3). Occlusion rates of 61.3% in aneurysms with no prior treatment and 64.6% in previously treated cases were recorded. DSA was performed in 54 patients with 2 having noninvasive CTA or MRA due to renal failure or advanced age. Occlusion rates are summarized in Tables 2 and 3. Forty-eight of the 56 aneurysms imaged were occluded at 6 months (85.7%). In patients not previously treated, the occlusion rate was 92.5%. In 16 patients with prior treatment of the target aneurysm, the occlusion rate was 68.7%. In 50 patients with no stent in situ, the occlusion rate was 90%. Only 3 of 6 cases with previous stent in situ were occluded. A total of 8 aneurysms studied at 6 months (14.3%) remained patent. All patients were on dual antiplatelet agents at that time. Clopidoprel has been stopped in all since then, with 2 further aneurysms occluding within 12 months. Two cases (3.5%) of in-stent stenosis of ≥50% were detected at 6 months. One (Fig 3) had long-segment intrastent 70% narrowing, decreasing to 30% at 12-month DSA. A second had 60% stenosis but had pre-existing mild narrowing of the parent vessel before PED. Both patients were ex-smokers, and 1 was noncompliant with clopidogrel. Both remain on dual antiplatelet therapy beyond 6 months, remaining asymptomatic. A 43-year-old woman, ex-smoker, with a 9-mm wide-neck superior hypophyseal aneurysm treated with a single PED. A, Lateral internal carotid artery DSA pre-PED. B, Lateral DSA 5 months after PED deployment demonstrates asymptomatic extensive long-segment in-stent stenosis. Clopidogrel and aspirin were continued. C, Lateral DSA 12 months after PED deployment shows marked improvement in the extent as well as the degree of narrowing (30%). Clopidogrel was ceased, but aspirin was to continue. Sixteen patients presented with focal neurologic deficit from aneurysmal compression, 15 acutely and 1 with long-standing homonymous hemianopia. Eight were given 48 hours of steroid cover post-PED, and 3 had temporary symptom worsening, which resolved completely with time and longer steroid cover. Ten cases resolved within 1 month, and an additional 3, in 1–6 months (Fig 4). Two had ongoing mild diplopia at 6 months but were markedly improved, with no change in the patient with long-standing homonymous hemianopia. A 62-year-old woman who presented with 2 days of increasing dysarthria, tongue weakness, and mild quadriparesis. A, T2-weighted axial MR image demonstrates a 30-mm aneurysm compressing the medulla and the fourth ventricle. B, Lateral DSA of the vertebrobasilar system shows a fusiform aneurysm of the proximal basilar trunk, incorporating the vertebrobasilar junction and the distal left vertebral artery. Two 2.75 × 18 mm PEDs overlapping in the sac were deployed into the basilar artery and left vertebral artery. Coils were place in the distal right vertebral artery to stop an endoleak. The patient was placed on steroids but, 36 hours after treatment, had worsening of quadriparesis and developed bilateral ophthalmoplegia. MR imaging (not shown) did not completely demonstrate an infarct, and CTA (not shown) demonstrated occlusion of the aneurysm and patency of the PED. The patient was given an additional steroid bolus and recovered to normal health within 3 days. C, Six-month lateral left vertebral DSA demonstrates occlusion of the aneurysm with no stenosis. The coils in the right vertebral artery are visible as artifact. CT at 12 months (not shown) did not show a reduction in the size of the thrombosed aneurysm. Clopidogrel was ceased, and aspirin was continued. 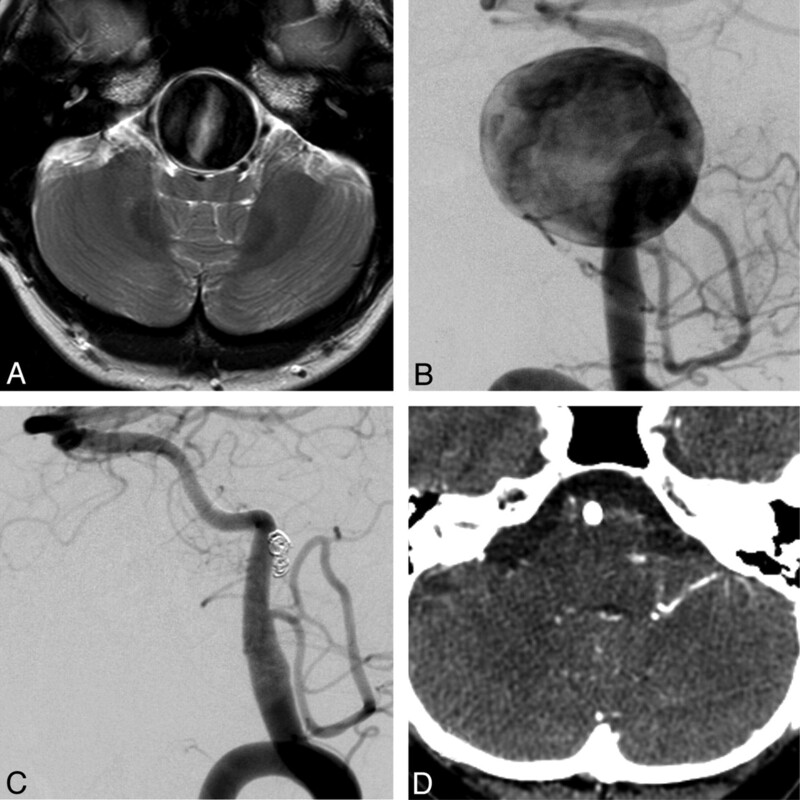 D, CTA at 18 months shows complete resorption of the aneurysm and absence of mass effect. The overall 6-month occlusion rate of 85.7% was lower in our series compared with other series.11,13 In cases not previously treated, the occlusion rate was 92.5%, in line with previous results. All giant aneurysms were occluded. Eighty-nine percent of berry and 63.6% with fusiform morphology were occluded at 6 months. In cases treated with no stent in situ, the occlusion rate at 6 months for this series was 90% (45/50) and at 14 months was 94.1% (48/51). These results compare with balloon remodelling 77%–85% 27,28 or stent-assisted techniques,46%–74%.26,29 The presence of a stent in the vessel results in a lower rate of occlusion, 50% in our small cohort of 6. Our incidence of peri- and postprocedural complications resulting in permanent morbimortality was 0% in 57 cases of asymptomatic aneurysms or those with mass effect. This compares favorably with balloon-assisted coiling morbimortality of 3.75%–14.1%.30,31 There were no delayed ruptures in this cohort. Rates of immediate procedural-related thromboembolic stroke of 0%11 and 3.2%13 are also reported in other PED series. This low published incidence should be compared with 2 reports on another flow diverter, Silk (Balt Extrusion, Montmorency, France), in which 4/13 cases had symptomatic thromboembolic complications directly associated with the procedure.32 A second article10 reported 15.4% (4/26) stroke and 4% (1/26) mortality with a 33% in-stent stenosis rate in a series of 26 patients in which the Silk flow diverter (Balt Extrusion) was successfully implanted in nonruptured aneurysms. No intraprocedural thrombus or stent occlusion occurred in our series or that of Lylyk et al,17 totalling 110 cases. Byrne et al6 reported an 11% incidence of parent vessel thrombosis following Silk implantation in a series of 70 cases. The literature has recently highlighted delayed rupture related to flow diverters in elective cases.32,33 Kulcsar et al32 documented 13 patients with delayed rupture following Silk use, of which 2 may have had SAH. Rupture was defined as early (2–48 days) in 10 patients or late (3–5 months) in 3 patients who were no longer on dual antiplatelet therapy. Eleven patients had an inflow jet after flow-diverter insertion. In all cases, it is our policy to insert the PED until any discernible inflow jet is eliminated, if practicable. Cebral et al33 documented 3 cases of rupture following PED placement, all occurring within 1 week of the procedure; 2 of these had stenosis related to the parent vessel. 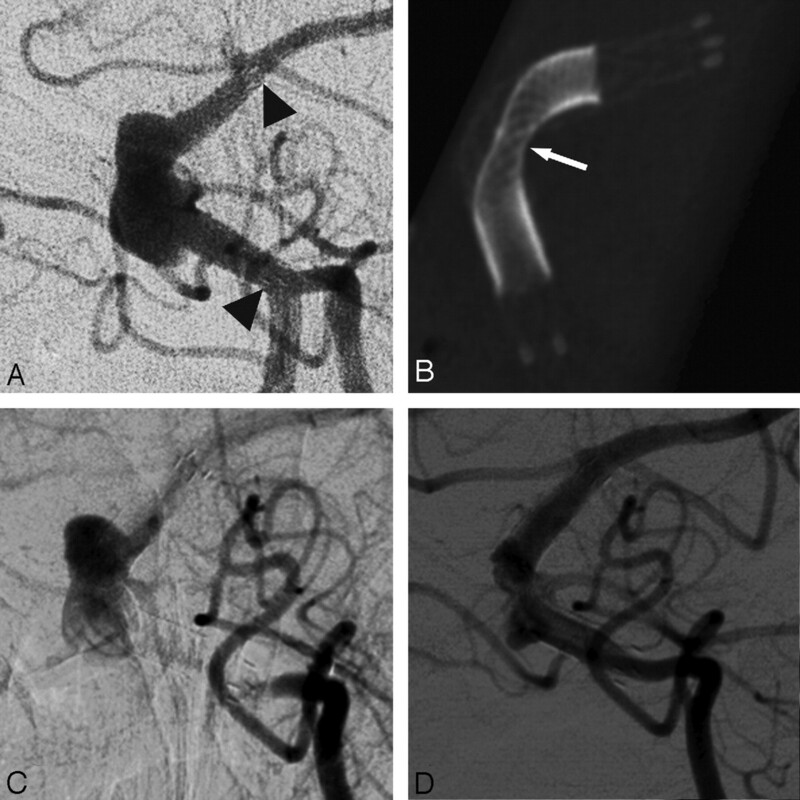 Cebral et al highlighted the possible role of parent vessel stenosis in aneurysm rupture post-PED, suggesting that coiling of these aneurysms may also be required in that setting. The rate of in-stent stenosis was low in our series. This has been observed in animal models24,25 and in human series11,13 showing a 0%–4.8% moderate or severe rate of asymptomatic stenosis with clopidogrel maintenance of 1 and 6 months respectively. The degree of narrowing anecdotally diminishes with time when comparing 3- and 6-month angiograms. We had 1 patient in whom this was demonstrated. Acute mass effect at presentation was documented in 16 patients, with 3 having transient deterioration after PED deployment. None had permanent sequelae and responded with time and ongoing corticosteroids. No uniform policy is followed with respect to administration of steroids in large aneurysms, but patients must be observed for deterioration and ischemia must be ruled out by clinical evaluation and MR imaging, if necessary. In the 15 patients presenting with acute mass effect, symptoms resolved (n = 13) or markedly improved (n = 2) following PED implantation. Deployment of the PED results in shortening of up to 50%–60%, depending on the size of the PED relative to the vessel and any discrepancy in proximal and distal vessel size. The device will tend to seek a larger lumen (“melon-seeding”), migrating proximally, if not well-expanded and anchored distally. As operator experience increased, the deployment technique changed, with more emphasis on distal vessel purchase and forward PED deployment, rather than unsheathing the device. In addition, axial reloading of the delivery catheter in the cavernous ICA is useful before the final portion of the PED is released. Nudging the proximal margin of the PED with the delivery catheter after deployment promotes proximal shortening of the PED. Anecdotally we believe this lessens potential shortening from the distal end, preventing proximal migration. PED reconstruction of aneurysms with wide necks, unfavorable dome/neck ratio, and large size is safe, with high occlusion rates at 6 months and a low incidence of in-construct narrowing. The technique can be used in a wide variety of patients, and those with acute mass effect reliably responded to PED implantation. Adjunctive density coiling may be warranted in high-risk situations, such as stenosis in the parent vessel, by using the PED as a coil scaffold support rather than a flow diverter in selected suitable cases. Disclosures: Hal Rice, Research Support (including provision of equipment or materials): ev3, Details: educational support for scientific meeting attendance, and scientific meeting sponsorship; Consultant: ev3, Details: ev3 proctor in Australia, New Zealand, and Asia Pacific region. Jason Wenderoth, Consultant: ev3, Details: I have twice been engaged by ev3 to proctor new users of the PED at US $1500 each. Accepted after revision May 16, 2011. What's Coming Down the Pipe--And Should We Be Excited, Concerned, or Both?